Former Explorer Editor Phil Brown shared some photos with us that he took last week from Newcomb and Long Lake. You can see them in the gallery above. 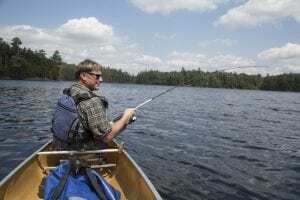 Brown was out working on the new edition of his guidebook Adirondack Paddling, which will likely be available next year. 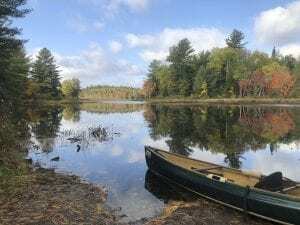 Here are some photos that I took in mid-April along the Saranac River. 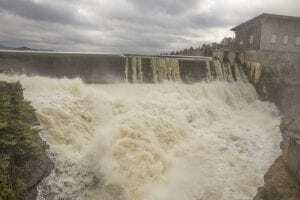 The photos were taken from a few miles downstream of the village of Saranac Lake to Union Falls Dam. This past winter the northern Adirondacks received a significant amount of snow, much of it in mid-March during a storm that dumped more than three feet of snow in places. As a result, spring runoff was strong this year, causing rivers to swell. This was particularly evident at Union Falls Dam, which is pictured above.